Summary: The beaches in and around the Archie Carr National Wildlife Refuge (Carr Refuge) on the central east coast of Florida represent a significant loggerhead rookery in the state of Florida. While Florida?s loggerhead sea turtle populations appear to have stabilized, continued monitoring and discovery of their migratory pathways and foraging areas is important to long-term management of the species. Satellite tracking from the Carr Refuge has occurred in the past, but new discoveries are being made each year. Learning about migration pathways of loggerheads from Atlantic nesting beaches will help identify areas of possible fisheries interactions and other sources of disturbance and mortality affecting Florida?s nesting population. In addition, this information will also expand our knowledge of critical Florida coastal habitats being utilized by Florida loggerheads outside of the nesting season. STC and UCF propose to deploy ARGOS satellite transmitters on four post-nesting adult loggerhead sea turtles from in and around the Carr Refuge to help identify principle foraging habitats for post-nesting Florida loggerheads, with an emphasis on the population nesting between Southern Brevard and Northern Indian River Counties in the Carr Refuge. Being able to identify offshore habitats utilized by these Atlantic coast nesting loggerheads could also help protection and management efforts for the fragile and important habitats the turtles utilize. Results would be presented at professional meetings, shared with regulatory agencies and tracks will be included in online educational programs. Funding from the STGP will be heavily promoted in all materials and website related to the project. Results: Four satellite transmitters were deployed on post-nesting female loggerhead sea turtles from the Archie Carr Refuge, FL. 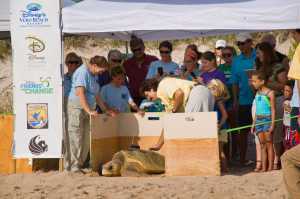 Based on previous years, we anticipated that at least some of the turtles would follow one of three identified migratory pathways and foraging areas: (1) a seasonal North-South migratory pattern between Virginia and North Carolina; (2) a residency in southern foraging areas; and (3) a residency in an area adjacent to the nesting beach. Of the four loggerheads, none headed North, a deviation from previous seasons. 'Pirate Patty' initially remained along the central east coast in waters off the coast of the Canaveral National Seashore for 110 days. She then moved south to the waters off Fort Lauderdale for 18 days, before continuing south along the Florida Keys for 20 days, before changing direction and heading east. Her transmitter stopped sending signals three days later, after a total of 150 days. Nine days later, her transmitter sent a single location close to the previous locations. Another four days passed before a new series of locations began over 343 km (estimated speed of 3.5 km/hr) to the east of the previous signals. Her transmitter continued to transmit for another 16 days, as she made her way southeast to an area between the Bahamas and Cuba (Map). She was tracked for 177 days, and travelled an estimated distance of 3,103 km. Two turtles went south to the Florida Keys, then north into the Gulf of Mexico. Both travelled farther north along the Gulf coast of Florida than turtles tracked in previous years. 'Pearl' took up residence in a foraging area off of Charlotte Harbor, while 'Peach' continued North to foraging area south of Apalachee Bay along the Florida Panhandle. Pearl has followed a characteristic direct migration to a resident foraging area, where she has remained. Her post- nesting migration lasted 26 days and covered 810 km. The remaining days have all been spent within her foraging area located about 16.5 km due west of Costa Cayo State Park in Lee County, Florida. As of this report, Pearl continues to send signals and has been tracked for 257 days (Map). Peach has followed a similar pattern to Pearl, but also displayed a foraging loop from her foraging residence. Her post-nesting migration lasted 45 days and covered 1,326 km. She spent the next 94 days within her foraging area, located about 50 km due east of Carrabelle in Franklin County, Florida, before leaving the area for 33 days and swimming a nearly 300 km loop to the south and back to the same foraging area. Peach was tracked for 225 days (Map). The last turtle, 'Lady Marmalade', initially stayed in the area for 19 days before migrating south for 21 days, over 487 km, past the Florida Keys to a foraging area about 50 km southwest of the Key West National Wildlife Refuge (KWNWR). She remained in the area for 11 days before heading east-southeast in a wide arc south of the Florida Keys towards The Bahamas. Before reaching the shallower waters west of The Bahamas, she turned north along the coast of Florida, but remaining 50 to 70 km offshore. After 7 days, she reached the waters off Fort Lauderdale and she headed back to the continental shelf and travelled south again, following her earlier southern migration back to the area southwest of KWNWR. This loop took 18 days. This time she only remained in the foraging for 8 days before once again travelling to the east, before turning and swimming west along the northern coast of Cuba. This second departure from her initial foraging ground turned out not to be another loop, but a 33 day migration to a second foraging area. This new foraging area, located 100 km north of the Yucatan Peninsula, Mexico, was a straight line distance of 536 km to the west-southwest, yet she swam over 1,750 km, more than 3 times longer than a direct route. She remained at her second foraging area for 103 days, before meandering over 580 km in a westerly direction for the past 49 days. Lady Marmalade was tracked for 256 days (Map).